SaskCulture ~ Where are the Buffalo? Buffalo returned to the streets of Regina last summer – in the form of a buffalo dance parade -- thanks to an initiative honouring the importance of the animal to Indigenous life on the prairies. In 2017, the Buffalo People Arts Institute (BPAI), in partnership with New Dance Horizons and Indigenous performers, hosted a series of workshops to create, design and develop buffalo head costume pieces and choreography. 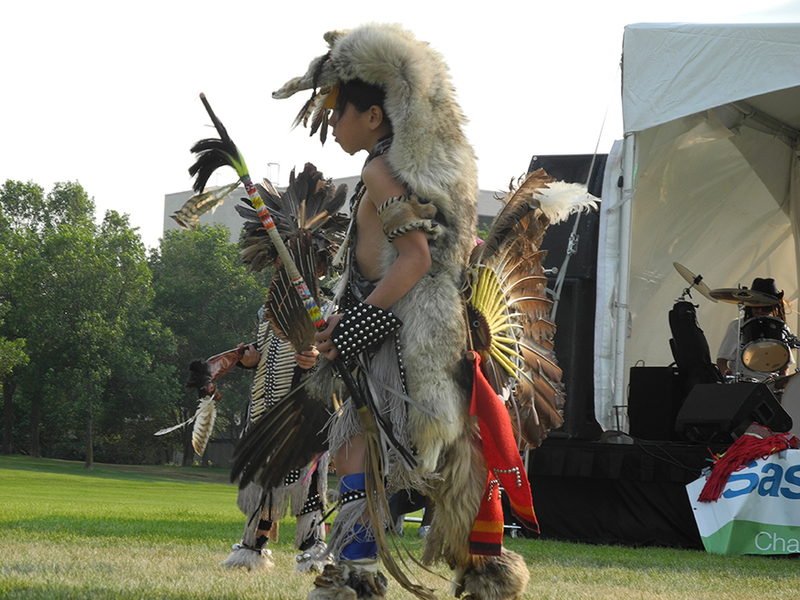 The project culminated at the Queen City Exhibition Parade in Regina on August 1, with a buffalo dance parade procession to honour the spirit of the buffalo. This project was part of the Resilience & Respect: Canada 150 & Beyond partnership, supported by Canadian Heritage Canada 150 fund. She goes on to explain that Indigenous peoples have lived amongst the buffalo for thousands of years before European colonization. Their familial connection to the buffalo was severed 150 years ago when the Canadian government implemented a policy to systemically clear the plains of buffalo to systematically remove Indigenous people from the prairies. “The government literally wrote, ‘Kill the Buffalo, kill the Indian.’ They attempted to decimate the food source, clothing and shelter that Indigenous people has so there was nothing left for [Indigenous people] to do, but be forced on reserves begging for government rations,” she adds. The creation of headpieces and dance movement emulating the buffalo was shared through community workshops. A week-long workshop was also held afterwards, attracting both Indigenous and non-Indigenous participants who learned about and undertook the role of the buffalo for the parade. Contemporary dance moves were incorporated with hip-hop, square dance and pow-wow movements and were dance to a buffalo honouring song. Altogether there were about 75 participants who took part throughout the project.